Stuart Broad was England's inspiration, taking the wickets of three of Australia's top four batsmen. Australia, strong favourites to retain the Ashes before the series, now have only five days to recover and reassess their tactics before the second Test starts at Lord's on Thursday. But Alastair Cook's decision to toss the ball to Moeen Ali for the final over before the interval proved to be a masterstroke. In the first over after lunch, Broad drew Steve Smith into an ugly poke away from his body, and for the second time in the match the world's number one Test batsman was out for 33. As England's relentless accuracy dried up Australia's scoring, captain Michael Clarke succumbed to temptation. Aiming an airy drive at Broad, he picked out Ben Stokes at backward point. And on it went. Adam Voges nicked his fellow Ashes debutant Mark Wood to Jos Buttler before Cook took a brilliant catch at the second attempt to complete Brad Haddin's miserable match. 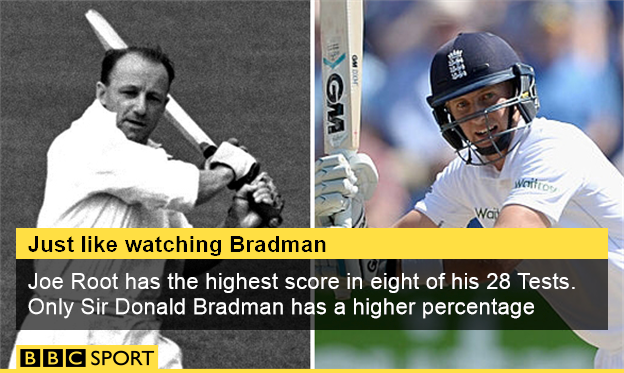 Broad showed himself to be England's man for the big occasion with another influential Ashes performance. And as they roared his run-up from the Cathedral Road End, he responded to remove Smith and Clarke to rip the heart out of Australia's batting. Seeing Broad in such inspired form carried echoes of 2009 at The Oval, when he took 5-37 on the second afternoon to set up England's Ashes series-winning victory. Then, two years ago, he was England's match-winner in Durham, with a spell of 6-20 in 45 balls as England sealed the series. 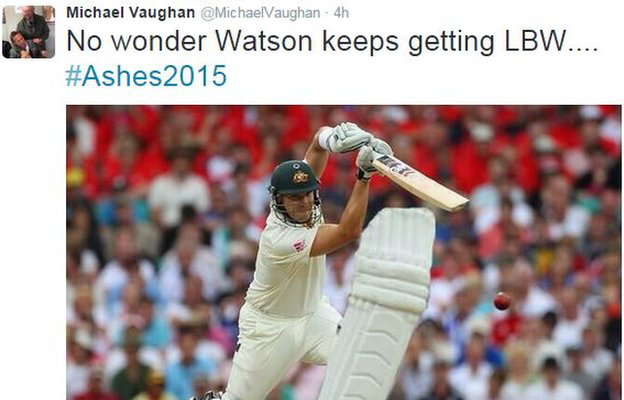 The 29th lbw of Watson's Test career must surely raise questions over the all-rounder's place in the team, especially given that his understudy Mitchell Marsh scored hundreds in both of Australia's warm-up games. Haddin is another player under scrutiny, following his pivotal drop to reprieve England's first-innings centurion Root on nought on the opening morning. The 37-year-old also conceded 24 byes in the match and looked a shadow of the counter-punching batsmen who tormented England in the 2013-14 whitewash. There are also concerns over the fitness of Starc, who required treatment for an ankle injury after day one, and was visibly limping during England's second innings. Given Ryan Harris's injury-forced retirement on the eve of the first Test, the Aussies can ill afford another casualty in their bowling ranks. 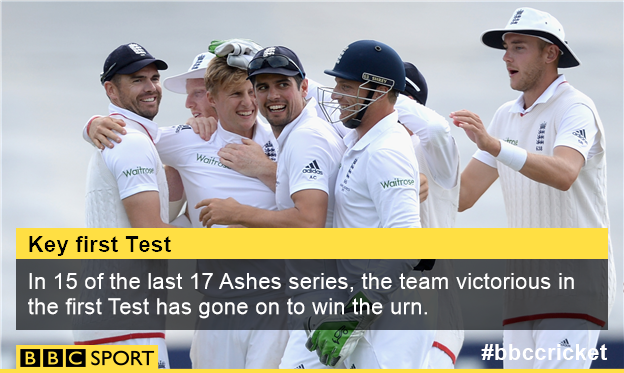 This is only the third time in 15 Ashes series that England have won the first Test, after 1997 and 2013. 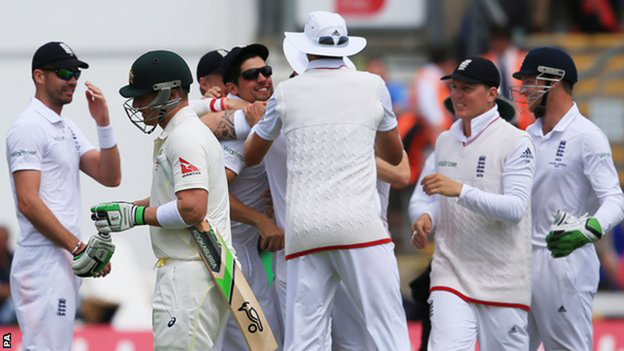 Australia have won only two of the last 16 Ashes Tests they have played in England and Wales. Chris Rogers' dismissal for 10 brings to an end his run of seven successive half-centuries, meaning he has equalled the world record. England captain Alastair Cook: "It was a brilliant performance. This Test couldn't have gone any better and we'll enjoy tonight. 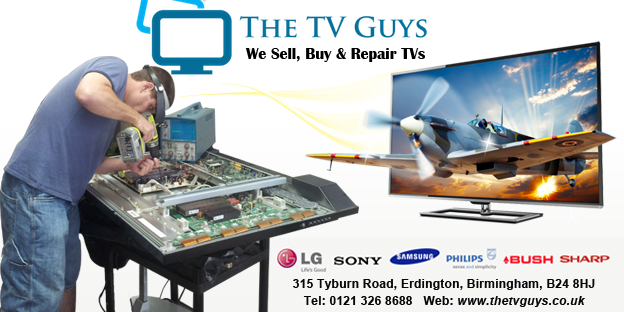 "Joe Root was fantastic and the bowlers were superb. "Everyone was talking about what's gone on in the past, but this is a different side. We had to look forward. We always took the attacking option in this game." Australia captain Michael Clarke: "We were outplayed in all three facets. England batted well on day one, we didn't take our catches and our batting let us down in both innings. "We look forward to making amends in the second Test. I'm sure the selectors will look at everyone's performance and make a decision."